A root canal treatment becomes necessary when the soft tissue containing the nerve and blood vessels inside the pulp chamber of a tooth become irreversibly infected with bacteria. If untreated it may become painful and develop an abscess. The transition from a healthy tooth to a tooth with an infected root canal happens over a period of time, where a tooth affected by tooth decay enters a restorative cycle. A decayed tooth is filled and replacement fillings / restorations become larger and deeper, until eventually the pulp chamber becomes exposed and infected. It can also result from direct physical trauma to the tooth, which causes death to the dental pulp complex of nerves and blood vessels. Certain dental treatments, such as crown preparation on vital teeth, also carry a risk of causing death of the nerve and infection of the root canal. 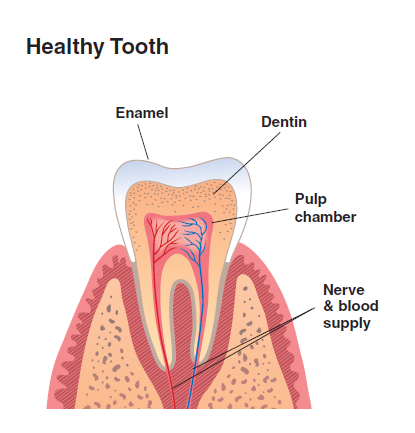 This illustration shows in a simplified format how, in a molar tooth, dental decay starts as a small cavity in the enamel, gradually spreads through the dentine and eventually reaches the pulp chamber, which houses the nerves and blood vessels, causing a pulpitis or inflammation of the pulp. This causes severe pain and gradually results in the death of the nerve and other tissue as the inflammation spreads to the root, cutting off an adequate supply of blood. A root treatment performed at this stage will prevent an abscess forming in the bone near the root tip. The purpose of a root canal treatment is to remove all dead tissue and decontaminate the empty canal space, fill the empty space with a biologically compatible material and seal off this space so that nothing can leak in or leak out. Sealing the root at its tip in the bone and at the occlusal (biting) surface of the tooth in the mouth is the ultimate objective of root canal treatment, which will ensure its success. Root canal treatment is a highly successful therapy in dentistry, resulting in many more teeth being preserved for a lifetime, provided that proper follow up care is provided, including placing a protective crown over a root treated tooth. Who will carry out my root canal? Carrying out a root treatment successfully requires a high level of skill, precision, expert knowledge and high tech equipment. Most root canal treatments are carried out by general dental practitioners. The procedure is straight forward in many respects, especially when carried out on a single rooted tooth like a front incisor tooth. However, it can become complex in multi rooted teeth, in teeth with additional lateral canals and in individuals with unusual anatomical variation. These cases are sometimes referred by a general dental practitioner to an endodontist who limits his or her practice exclusively to carrying out root canal treatments. The treatment usually follows the following steps. It may be carried at one treatment visit or it may require 2 visits or more depending on the level of complexity.